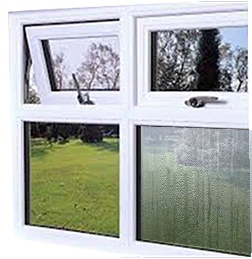 A misty window or blown double-glazed unit is where the window appears dirty or misted but cannot be cleared or cleaned. Interstitial condensation occurs either when the unit seal has failed and the airspace is saturated with moisture, or when an internal component (i.e. Georgian bars etc.) has deteriorated and given off organic solvents. Under both of these conditions the appearance of condensation on one or both airspace surfaces can occur subject to the glass surface temperature. How long it takes for a blown or broken unit to show will depend on the position, in full sunlight or exposed to extremely wet conditions. This misting means that the double glazing unit needs replacing.